1. Talk us through a typical working day? Every day is different for me as Monday to Wednesday I teach art A level at a secondary school which I love, it keeps me up to date with what the teenagers are up to- they teach me what jungle music is! Thursday and Friday are my precious private days that I love to spend painting in my studio. In between all that I fit in kids’ school run, the dog walks, baking with my daughter and dealing with children’s homework! 2. Pick any three favourite people (famous or not!) you would like to have coffee with. As an artist I find Jo Fraser incredibly inspiring- she is a BP Portrait award winner and I love her work. I also really love Angel Smallbridge (from the Netflix series “Escape to the Chateau”) as she is fun, quirky and creative. Kirsty Allsop is a guilty pleasure because I admire the enthusiasm and energy she puts into everything she does. Mexican artist Frida Kahlo would be a fourth is I was allowed one! 3. How do you like your home to make you feel? My home is my sanctuary but it’s not precious at all, I think it is quirky and homely and an expression of my personality. I like mixing colours and bright tones with florals and prints and I adore vintage pieces. 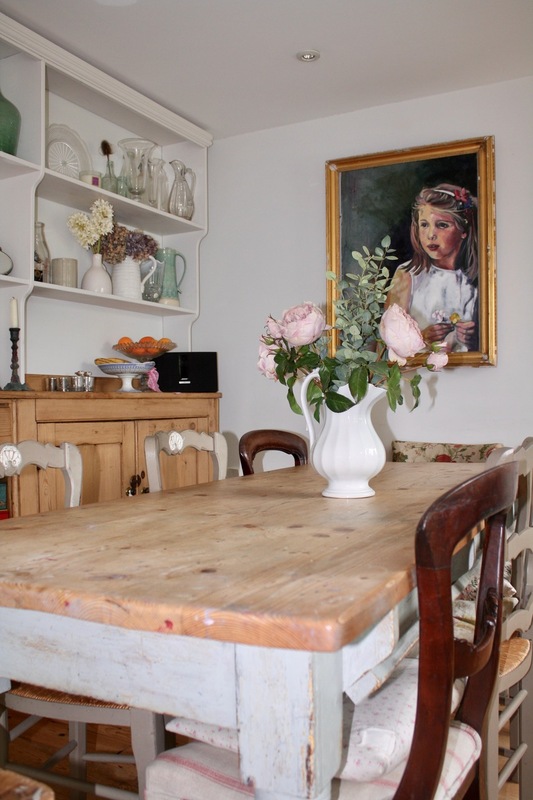 I suppose my home is a curation of vintage finds I’ve collected over the years, as well as favourite pieces of art by mother and paintings I’ve done of the children and pets. I would say my style is quite eclectic; I have vintage mismatched chairs around my kitchen table and I made the blind in my bathroom out of a vintage tea-cloth. I have really enjoyed the artistic expression of creating my home. I am happiest when I am helping other people, whether it’s teaching, cooking for someone, or baking. Doing things for other people means a lot to me, it’s rewarding to see how your efforts can make other people happy. 5. Do you have a favourite item in your home? My favourite item is my china cabinet. It’s full of vintage cups and saucers that my husband Chris buys for me and he brings me tea in my favourite cup and saucer on mother’s day. I just love the variety of pastelly dusty colours, they remind me of pick n mix sweets! And dinner tastes best off my favourite yellow plate- and never a white plate- it just makes me happy! 6. What colours/ seasons are you drawn to? Any favourite holiday destinations? How are these reflected in your home style? I love the yellows of the Easter season; the china bunnies, the yellow table cloth I get out and of course the Spring flowers. I love dressing the table for Easter lunch, it’s an other create process in a way. 7. What is the best piece of advice you’ve been given or indeed you would like to pass on? Be resilient and have a growth mindset. A lot of people say to me they could never sketch an apple for example, but I believe we were all born the same: anyone can learn to be an artist if they like it and practice it and are resilient in their learning. I can teach you to break down that apple into shapes, colours and light- I believe anyone could paint it.